Orange pekoe and pekoe cut black tea, natural flavor. 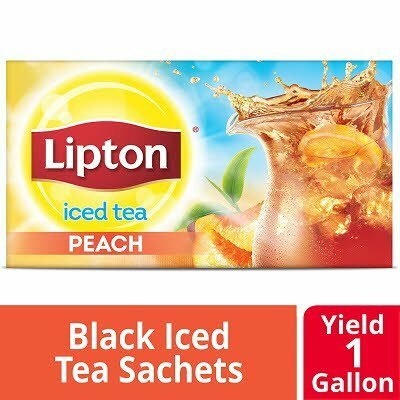 Ideal for restaurants, casual dining, and quick service establishments, Lipton Unsweetened Smooth Blend Iced Peach Tea offers delicious, sweet peach flavor and an enchanting aroma that your patrons will appreciate. Made from carefully selected black tea leaves, this tea is perfect for preparing bubble tea and other cold beverages that offer juicy summer flavor year-round for your guests. Each bag prepares 1 gallon of iced tea. Sourced from 100% Rainforest Alliance Cerjpgied tea estates, Lipton teas are picked at the peak of freshness for a naturally smooth taste and will delight any tea enthusiast. The tea sachets, cartons, and case are recyclable and packaged in a zero-landfill facility, making this tea a responsible choice. Brew in hot water until desired strength is reached. Best brewed by hand or through a coffee maker. See carton for further preparation instructions. Sweeten to taste with honey and/or sugar, serve over ice, and add orange or lemon slices.